At first glance, neuroscience and art make odd bedfellows. What does art have to do with neural functions and the nervous system? Quite a lot, actually, as the current exhibition on the digital wall at the Hargrave-Andrew Library demonstrates. 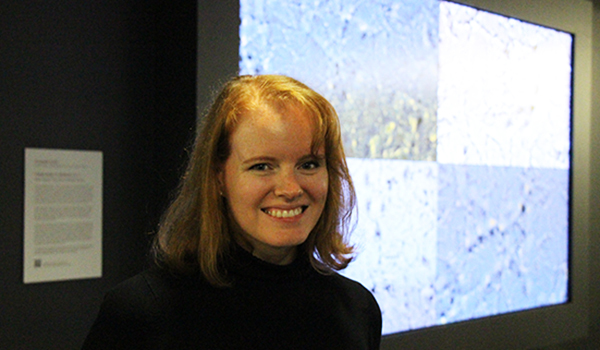 Dr Elizabeth Zavitz, a Monash Biomedicine Discovery Institute (BDI) research fellow from Dr Nicholas Price’s lab, has created a digital exhibition that illustrates how different types of visual information combine to produce our perception experience. The exhibition emerged from the Price Lab’s studies into how the brain computes visual information. The lab focuses on context: how each isolated visual computation is influenced by both recent experience and other, simultaneous, visual experiences. This video captures some of the spatial contexts in which the brain specialises. In describing the exhibition, Dr Zavitz explained that we're only likely to experience a very small subset of the huge diversity of possible visual images. “In theory, there are many times more visual images available for us to perceive than there are atoms in the universe,” Dr Zavitz said. “Like frames of television static, we cannot perceive and comprehend all of them individually, there are just too many. Fortunately, the things we end up seeing are constrained,” she said. The things we end up seeing are not only constrained, but constrained in very predictable ways because we live in a world of objects, not a world of random static. These constraints produce regularity that the brain can take advantage of to improve how it processes visual information. At a public ‘meet the researcher’ event on Wednesday 18 April, Dr Zavitz explained what you see in the exhibition and why. “Visual information comes in two forms: energy and spatial structure. The energy is the combination of frequencies and proportions present in the image, analogous to the combination of notes played simultaneously by an orchestra,” Dr Zavitz said. “Spatial structure refers to how that energy is distributed across the space of an image–it is the melody the orchestra plays,” she said. Dr Nicholas Price spoke of the importance of engaging the wider community to inform and introduce them to complex science. “Science communication takes many forms; I think this is a fantastic example of producing something captivating and visually intriguing, that will hopefully motivate people to find out more about the science behind the art," Dr Price said. Titled ‘From noise to meaning: how visual information makes sense’, the exhibition begins with static-like noise, similar to what old television sets often displayed during weak signal transmission. The noise in the video gradually thins until the image becomes sparse and individual patterns emerge. “Notice how the viewing experience becomes more comfortable as the visual information is arranged in increasingly natural ways and becomes more consistent with what the brain anticipates,” Dr Zavitz continued. “The regularities presented in the video have shaped how our visual brain has evolved and developed, and can help us understand the inner workings of neural networks,” she said. The exhibition will remain on display until the end of June. Visit the Hargrave-Andrew Library to experience noise becoming meaning for yourself. 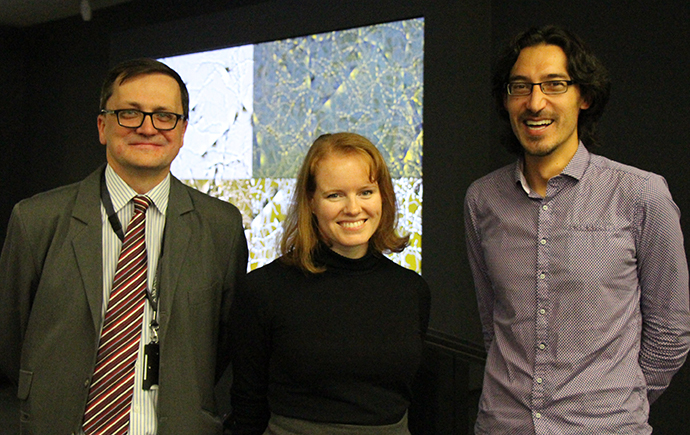 Pictured above: L-R: Director Research, Monash Library Administration, David Groenewegan, research fellow Dr Elizabeth Zavitz, Deputy Head Neuroscience Program, Dr Nicholas Price. Research fellow Dr Elizabeth Zavitz.